Salutations! Having spent a week doing too little revision for too long and watching Capra films, I realised with a jolt that I had not posted since last Monday and, since I did not wish to do the whole Monday-Monday (whoops! I have not posted for a week) thing, I felt I should post this sooner than I otherwise intended to. Anyway, the caffeine and bruise on my head is keeping me awake so I came to the conclusion that posting would be a more valuable use of my time than surfing BBC iPlayer or Youtube in order to find a random video or programme that I would be happy to watch until I felt ready to curl up into a ball and sleep. I am here to present those of you who do not know to Guy Bourdin. Photographer - one of the greatest fashion photographer's of all time. Guy Bourdin was born in Paris on the 2nd December 1928. When his parents separated, and his mother left approximately a year after giving birth to him, he went to live in Normandy with his paternal grandparents who owned a brasserie. When his Father remarried, he moved back in with his father, stepmother and stepsiblings. By all accounts, he only met his mother once and his only abiding memory was of a sophisticated parisian woman, with pale skin and red hair, an image that was recurring in many of his photos. Abandonment became a personal and professional motif. At the age of eighteen he went on a tour of Provence and met Lucien Henry, an art dealer. He stayed with Lucien for six months where he seriously applied himself to drawing and painting and initially decided to become an artist. When it was time for his military service he ended up in Dakar as an aerial photographer in the Air Force. After his military service he returned to Paris. He still drew and painted and started taking pictures for himself. He was influenced by Surrealism and of all the Surrealists. His greatest influence was Man Ray (a notable work is the Violon d'Ingres) with whom he became friends. Man Ray even wrote the catalogue text to Bourdin's first exhibition in 1952. It was two years later that, at the age of twenty-seven, he was offered a job at French Vogue. His debut was four pages of hats. One of the pictures featured a woman standing below three skinned calves' heads. It was a statement that marked out the direction of his style as a photographer. He was best known for his work for French Vogue from the mid fifties to the mid eighties.... and it was typically dark, theatrical and even disturbing. In fact, I'm going to set this straight, to a relatively innocent 1970s audience, some of it was perversely shocking (for general appearance in a Fashion Magazine) and much of it was macabre. 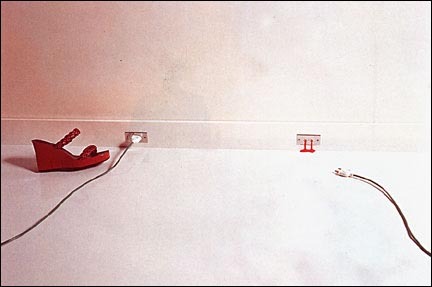 Guy Bourdin's advertisement for Charles Jourdan shoes showed the chalked outline of a woman on an apparently blood spattered pavement, her gorgeous red shoes and red sunglasses abandoned near where her body had fallen. A lot of the darker pictures that Bourdin did take were never even published. One such unpublished photograph, taken in 1978, showed a naked woman draped across a desk, her throat cut, surrounded by blood. So yes, there is something more than a little strange about his obsession with death and desire. People have called him a misogynistic puppet master, which is perfectly fair considering - Guy Bourdin was a short man with an apparently whiny voice, and had a reputation of being incredibly demanding. Dark rumours (which were not really rumours, more unpleasant truths) surrounded him: his mother abandoning him as an infant, the suicides of his wife and two of his girlfriends, and the cruelty in which he treated his models. In many ways he was like Warhol and Hitchcock, using photography in a more psychological way and using the personal understanding of an outsider looking in. He died of Cancer in 1991. His son Samuel Bourdin released a book with the finest prints of his father's work, called "Exhibit A" in 2001. His first retrospective exhibition was held at the Victoria & Albert Museum in London 2003, and then toured the National gallery of Victoria in Melbourne, and Jeu de Paume in Paris. In 2003, Madonna's music video for Hollywood (which I have posted here, purely for the purpose of illustrating my point than any great love of this song) was greatly influenced by the photography of Bourdin, so much so that a lawsuit was brought on against her by Bourdin's son for copyright infringement. I should be back with something lighter next time because, after a post in which I listed forms of human sacrifice then this one, in which I discussed someone who very much thought of himself as 'un poete damne' whose emotional pain was self-inflicted, I think something lighter would clear the air. 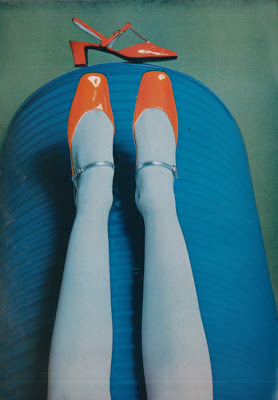 Guy Bourdin was very talented. These photos are so unique and beautiful. Les images vont parfaitement avec la vidéo ! Whatever can be said about Guy Bourdin in his personal life, there is no doubt that he was extremely talented photographer. I've always loved his work - I can't think about Vogue in the 1970s without thinking of him. What a wonderful post! These are so cool, I'm going to have to look up more of his work now.